I enjoy going to the library. It’s where I work on this blog mostly (home is way too distracting). I like to take some time, head to the book shelves and browse through the cookbook offerings. Then find a comfy chair with a nice view and do a little old fashion reading. Every time I do, I say I need to do this more often. It’s refreshing to just leave the laptop and phone behind and dive into a book. During a library visit in 2010, I discovered the Niman Ranch Cookbook. For any meat lover it is a must read. Not only does it say a lot about their business, raising animals the right way, but the recipes are worth the price of admission. So many good ones in there. And like any good cookbook will do, this one was inspiration. I was inspired to make pork chops for dinner. I love cooking pork chops on cast iron. It gets real hot and helps to brown the pork evenly. On that day, I already had some pork chops in the fridge. Just needed a way to cook them. 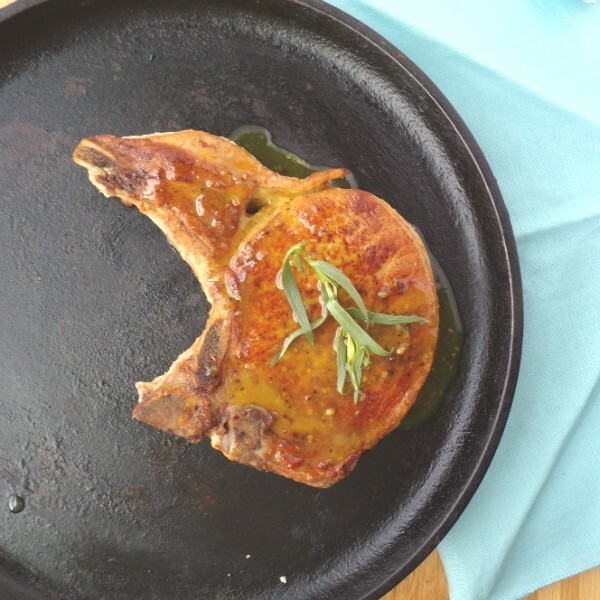 The Niman Ranch book had a recipe for cider glazed pork chops (I would eventually make a cider glazed pork chop). Since it wasn’t apple cider season I opted for something available year round – honey and mustard. Your glaze is only going to be as good as your mustard. The best mustards are stone ground. They pack the most flavor. 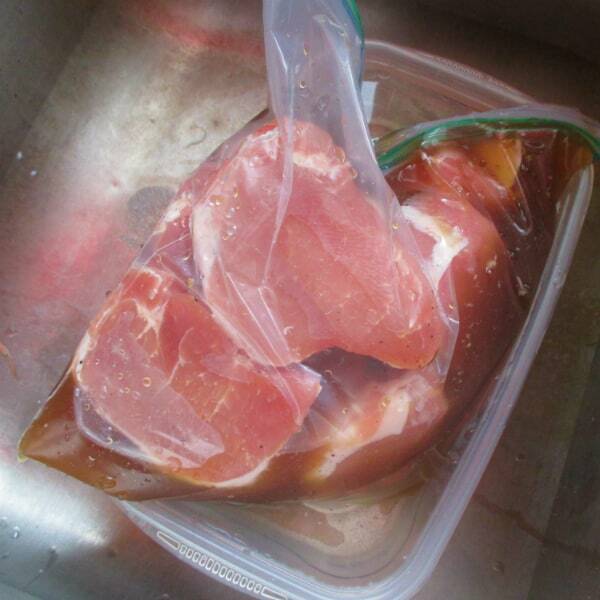 I brine my pork in gallon sized plastic bags. And when I put the bag in the fridge I always set it inside another container just in case the bag leaks. Alton Brown taught me to brine my pork. And I am so thankful that he did. It has changed my world. Because pork really needs it. It has gotten more lean over the years as the pigs have gotten leaner and leaner. Not because they have been on a diet but because that is what the pork industry has been seeking, leaner meat. Since it’s so lean it’s a challenge to keep it from drying out. Whenever I cook pork with a dry heat method I always brine it first. Through the wonderful process of osmosis, the interior of the meat becomes both juicy and flavorful. The brine is basically the same one that Alton Brown used on an episode of my much loved Good Eats to make a slow cooked pork dish. You can do a basic brine with just water, salt, and sugar, if those are the only ingredients you have on hand. I like it better replacing the water with vegetable broth (you could do chicken as well). Also adding some additional seasonings like whole black peppercorns or freshly cracked ones. Pepper is good on pork there should be a law that you must put freshly ground pepper on all pork. Making your brine with brown sugar instead of white will also add to the flavor you got going on. My way to do it to cook them in a cast iron pan. 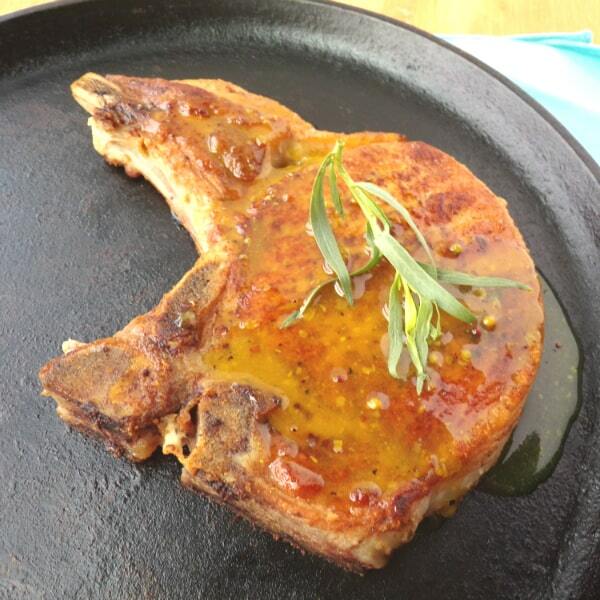 You can use a grill pan to get those lovely grill marks (as seen in the aforementioned cider glazed pork chops). I like a pan with higher sides so that you can make the glaze right in the pan without dirtying another dish – always a bonus in my house. The chops are cooked on one side, then flipped over and cooked on the other side. The glaze ingredients then go in to de-glaze the pan, that is to get all the delicious brown chunks that stuck to the bottom of the pan. Once the glaze is thickened, put the pork back in the pan for their coating of flavor. Here is what the glaze looks like before coating the pork chops. It may seem too thin at first. Be patient and let is naturally thicken. No flour or corn starch needed or wanted. 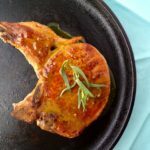 Could You Bake These Pork Chops? Absolutely you could. I know there are people that wish to avoid cooking oil, so they choose to bake in the oven instead. If you are going to do that, choose a thick pork chop, at least in the 2 inch range. You can insert a probe thermometer, that will best tell you when the pork is perfectly cooked. I always use thermometer when cooking meat in the oven, because it takes out all the guess work. You can easily your glaze separate in a pan the stove top and have it ready to go when the pork comes out of the oven. A little bit of fresh tarragon adds a nice fresh flavor to the chops. If you look closely you can see the speaks of mustard from the ground mustard I used. Electric skillet works great for cooking the chops in as well. Prepare them the save way as in the recipe below. These pork chops are brined, sauteed, and topped with a honey mustard glaze. Combine all the ingredients into a saucepan over high heat. Cook until the salt and sugar are dissolved. Then remove from the heat and add about 1 pound of ice to cool the brine down. Give it a good stir and set it aside. Now take your chops and place them in a gallon sized plastic bag and dump the brine into the bag. Seal the bag well, place it in a container just in case the bag leaks, and place it into the refrigerator for 1-2 hours. 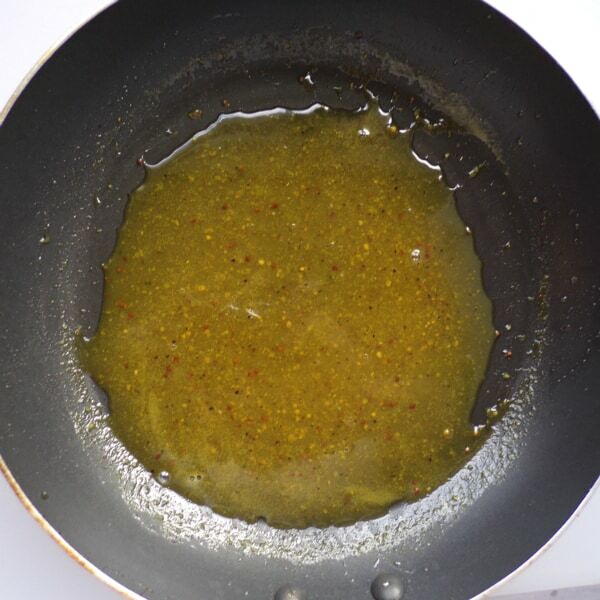 Start by placing about an inch or so cooking oil in the bottom of an skillet. Remove the chops from the brine and pat them dry. Season them with black pepper and kosher salt. When your skillet is ready, place them in, so that they do not touch each other. Cook for 4-5 minutes until the chops are golden brown, then flip and cook for another 4-5 minutes until the other side is brown. Remove the chops from the skillet. Now add your chicken broth and scrap anything that stuck to the bottom of the pan. Add the honey, mustard, Worcestershire sauce (if using) and cider vinegar. Stir constantly until your glaze is nice and thick, should only take 2 to 4 minutes. Return the chops to the pan and coat them in the glaze. Then enjoy! Previous Post: « Where to Find SweeTango Apples in 2010?